Harvesting data from your digital media efforts is easy these days. Turning the data into actionable insights is not so easy. Marketers and business owners sort through a mountain of analytics reports to understand how they are moving a prospect through the buyer journey. Data alone does not provide clarity. It needs context. Yet the stakes related to understanding your digital brand are high in our digitalized marketing world. Building and maintaining revenue means turning strangers into customers who know, trust, and champion your brand. Those customers do an unprecedented amount of their research now online. How sticky is your website? How does the number of Twitter followers impact your brand revenue? Does that YouTube viewer impact your sales numbers? We’ll give away the ending: it all influences your revenue. It is all a part of the customer experience journey. A prospect needs to hear your message at least 20 times before they’ll take action. Chances are, you’ve seen a graphic of the sales funnel at some point in your career. It’s hard to miss. While we have issues with how a sales funnel is portrayed; (wouldn’t it be wonderful if you just dropped potential customers in the top of the funnel and they magically slid down the funnel to become customers?) 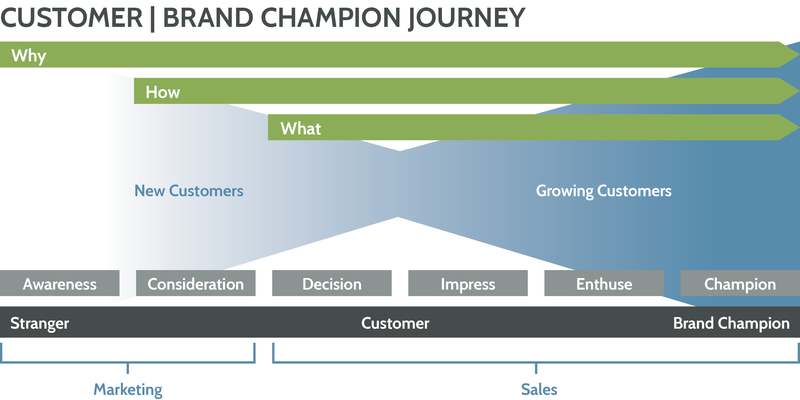 it does capture the buyer journey stages well: Awareness, Consideration, Decision, and Brand Advocacy. By combining industry, competitor, and internal benchmarks, with over 100 digital media data points, and then indexing that data into buyer journey stages, the Marketing Currents Index™, or MCI, helps our clients make sense of their digital brand in an easy-to-assess monthly score. Add to the scoring process a monthly human interpretation and insights from our team and you have a way to quickly analyze your efforts and make decisions going forward. Scores: Scores are divided into an individual score for each of the buyer journey stages, which can be anywhere from 0 to 100. Then an overall score is provided, up to 100. Graph tracking weekly scores for an easy visual reference. The data behind the score. Each point of data is collected weekly, and each week’s data is provided in the monthly report. Out of fundamental branding discovery processes, and input from your senior team, we will merge competitor and internal benchmarks into an initial “Benchmark” report. The benchmark MCI will consider industry (your industry) averages when evaluating your company’s numbers. Opportunities often come out of an initial landscape review and opportunities report, which can be rolled into where we are seeing dips in the data to bring up the scores and keep your customers moving through the funnel in a respectful way. We will then provide a report monthly, which includes weekly data. Why Did We Develop the MCI? Co-created by Corbae Creative and Identity³, the MCI was developed to make sense of the overwhelming amount of metrics, analytics, and data available in digital marketing. We love data. It helps us paint a picture of what is going on with marketing and outreach efforts. We found this raw data didn’t help us or our clients discover “holes” in their marketing effort. By working with a marketing analyst, we came up with a system to track the data against the buyer journey. This helps give us valuable insight into how to highlight marketing opportunities for our clients. Do they have an awareness issue? Are viewers getting all the way through the consideration phase, but just not buying? 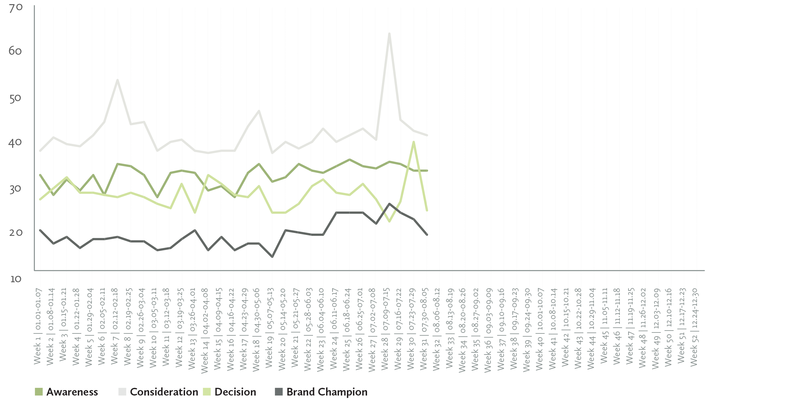 Are customers buying, but not turning into brand advocates? Interested in a more in-depth look into the Marketing Currents Index?